An adequate supply of vitamin A during pregnancy and breastfeeding plays an important role for development of foetus and neonate, especially in lung development and function. 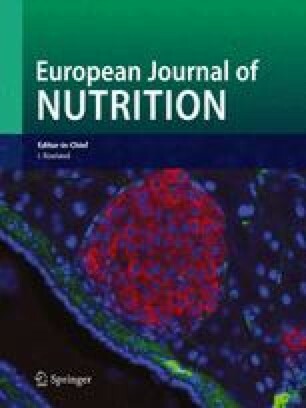 Aim of this pilot study was to analyze vitamin A and β-carotene status and to investigate the contribution of nutrition to the vitamin A and β-carotene supply in mother–infant pairs of gemini or births within short birth intervals. Twenty-nine volunteers aged between 21 and 36 years were evaluated for 48 h after delivery. During this time frame a food frequency protocol considering 3 months retrospective was obtained from all participants. In order to establish overall supply retinol and β-carotene levels were determined in maternal plasma, cord blood and colostrum via HPLC analysis. Regardless of the high to moderate socio-economic background, 27.6% of participants showed plasma retinol levels below 1.4 μmol/l which can be taken as borderline deficiency. In addition, 46.4% showed retinol intake <66% of RDA and 50.0% did not consume liver at all although liver contributes as a main source for preformed retinol. Despite high total carotenoid intake of 6.9 ± 3.6 mg/d, 20.7% of mothers showed plasma levels <0.5 μmol/l β-carotene. Retinol and β-carotene levels were highly significantly correlated between maternal plasma versus cord blood and colostrum. In addition, significantly lower levels were found in cord blood (31.2 ± 13.0% (retinol), 4.1 ± 1.4% (β-carotene) compared with maternal plasma. Despite the fact that vitamin A and β-carotene rich food is generally available, risk groups for low vitamin A supply exist in the western world. The authors are grateful to the staff of the University Gynaecological Hospital Ulm for collection of samples and to the mothers and newborns for donations of blood and colostrum. Furthermore, the authors would like to thank BASF Aktiengesellschaft, Ludwigshafen, Germany for financial support of this study.